This entry was posted on January 12, 2016 by Jessica Anderson. I don't give participation awards because I don't think kids can handle losing. I give them because I reward their contributions to the team. Sunday night I was watching the Golden Globes and yet again, Participation Trophies got trashed. I was crushed when Ryan Gosling, one of my favorite actors, made a negative comment about participation trophies when presenting. Why is everyone hating on participation trophies? I know I'm the owner of a trophy company, but I'm also a mom and I don't see how awarding participation trophies is making a slacker society. So this post is a counter argument - reasons WHY TO GIVE PARTICIPATION TROPHIES. If you haven't heard, Bryant Gumbel plus many others are slamming the practice of awarding participation trophies to kids. The argument says that the over praise of our youth is causing problems with that generation and participation trophies are to blame. It's sad that something so positive is being twisted into a negative. I feel that when a young child participates in youth programs they learn commitment, dedication, and team work. I see no problem when a small reward, such as a trophy or medal, is awarded for successfully completing one of these programs. 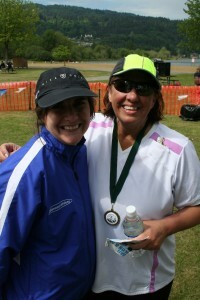 My Mother in Law Bonnie and I after we finished a sprint triathlon. Why is ok to get participation awards at a race, but not ok to give kids at the end of a season? 1. Every 5K, 10K, Half or Full Marathon gives participation medals and t-shirts for finishing the race. These runners train and at the end of their event, whether they finish first or last, they get a medal. How is this different from a child who attends every practice and game and then gets a medal at the end of the season? 2. Pro Athletes get Championship rings whether they are on the star line up, are injured, or sit on the bench the whole season as the third string. When the team wins, everyone gets an award, regardless of how much they contributed. 3. Many employees receive Years of Service awards for working for a particular amount of time at a company. Whether the employee receives hardware or cash, this is an award to motivate retention, regardless of performance. What gets me is when adults get these types of awards, they are a good thing, but if a child gets a participation award, the argument is that the child is going to grow up being entitled and/or have easily hurt feelings. Is this what happens to adults too? Are you a coach with a kid who is a star athlete on the team? Then your child has probably been getting trophies their entire life and they really have no value to you or your kid – I get it. But most children are not stars; they have to work to do well. My kids are not naturally gifted athletes but like to participate to stay active and be social with their friends. Kids like mine are the real reason for participation awards - kids that show up week after week but may only play in the game for a few minutes. They are the ones who earn a trophy, because without those kids sticking with it, you may not have a team. I see participation trophies as a “sports retention award”. With so many options of what to do with their time, kids can choose to play video games instead of joining a team. Why not reward them for keeping with the sport so they will continue to play? Have a hang up about giving trophies? Fine, don’t give a trophy. But DO give something as a memento of the season so the kids know you care. My daughter played on a soccer team with an awesome coach. He was amazing with the girls and they had a great season. But he didn’t believe in giving participation trophies. Well my daughter was crushed, especially since her parents own a trophy company. Sure, we could make her a trophy, but it doesn't mean anything if it doesn't come from the coach. As I stated above, she wasn’t the fastest or most aggressive player on the team, but she did try and she attended all of the practices and games. At the end of season team party, true to his word, the coach didn’t give trophies but he did give the kids a photo collage with pictures from the season. To me I don’t see the difference between a small trophy and this photo gift. They are both small mementos to recognize the season. Neither one results in kids being spoiled and entitled; they are both a way to acknowledge a season well-played. I know to an adult a participation trophy is no big deal, but to a young child, these really matter. Getting a trophy from a coach or teacher is quite meaningful and a participation trophy becomes a prized possession and point of pride for young children. I am a fan of participation trophies for young kids. This is the carrot that gets them through their commitment, whether that's a sports season or a year of piano lessons. However when kids get older and more skilled, a participation trophy may no longer be useful. 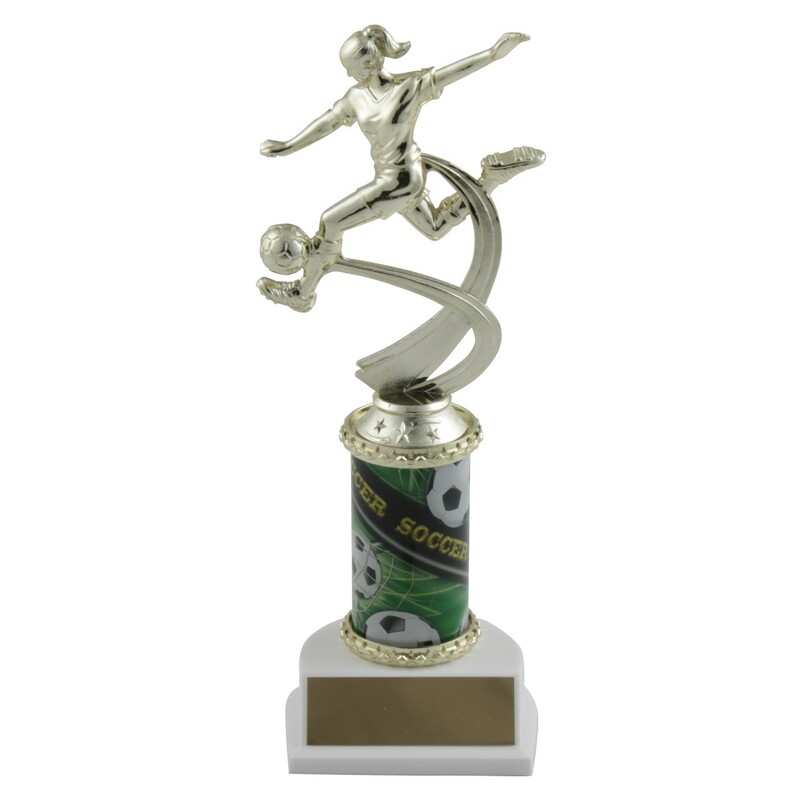 Once in select sports and activities most kids no longer receive participation awards; they only receive trophies when winning tournaments, competitions, or other championships. However these older kids may still receive mementos, just in a different form. Pins, coins, t-shirts, water bottles are all forms of participation awards that kids receive for attending different events, such as tournaments. festivals and jamborees. These are fun for kids to collect, trade and wear with pride. However, I do not condone craziness - there is a line that can be crossed. For example, we had a recent customer who changed the engraving on her son's trophy from "Most Improved" to "Most Inspirational" because she didn't like the award her son received. In my book that is NOT ok and gives my industry a bad rap. Coaches, teachers, league organizers, administrators, and parents - there is a value and a necessity of recognizing our youth for committing to and participating in positive activities such as sports, academics, and the arts. A small reward in the form of a participation award at the end of the season is a good thing, especially for younger kids who are trying out activities to see what sticks. Read more thoughts about Participation Awards, check out my past blogs, A Mom's Opinion of Participation Trophies and Making Sports Trophies Meaningful. Agree? Disagree? Feel free to let me know. Preach on! Excellent article. Thank you for posting! I totally agree. A well done article and a great idea to present to the Today Show as they have repeatedly brought up the participation trophy in a negative way. It is time someone takes center stage with your well thought out opinions. Thanks Bonnie for your support! I completely agree with you. Not every child will win a race or make a select sport. So for those kids, these mementos make it special for those children to have the experience to be part of a team. Their smiles make it worth it. As a coach, most of the time, I don't have time to create little gifts for each child so a trophy or metal is a nice recognition for the child wiliness to try, or being the best team mate, or giving it 100%. Its confidence is what we are trying to give these kids when they are trying these sports or activities. All the skills they are learning on being part of a team are real life skills. So if you look at the soft skills captured by being part of the team, they are being recognized for their efforts. When you get to select sports, those kids will not get trophies or medals for being a great team mate or giving it 100%, they will get their recognition when they win a tournament or game. For those trophy haters, go play select sports. But for those younger kids, a coaches goal is to make sure the kids have fun and to try to come back next season. Coaches need to adapt to the needs of the kids based on age, not treat a kindergartner like a teenager. Let the kids be kids and enjoy the experience. They need to be rewarded for the goals they are trying to accomplish, not whether they win or lose their games. Totally agree - thanks Kari for posting! Very well written Jessica. Some people think winning is the most important thing on this earth. In my way of thinking, trying trumps winning. Being a winner is nice but learning to participate and trying to do your best is so important in life. We all can't be winners, but we all can try. A participation trophy is an inspiration for a lot of youngster to keep trying. Exactly! By trying you are a winner!